For many occasions TravelSheets and MummyLiners are interchangable. TravelSheets tend to be used when the emphasis is on ample foot room. MummyLiners are preferred when minimum weight is essential. A TravelSheet is an extremely lightweight and roomy sleep sack or sleeping bag liner. 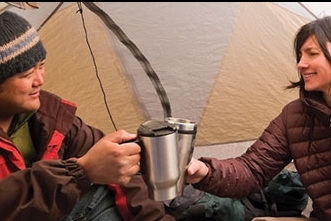 A MummyLiner is an extremely lightweight tapered sleeping bag liner.